—from Journey of the Pink Dolphins. Scientists call them Inia geoffrensis, an ancient species of toothed whale whose origin dates back about 15 million years. To the local people of the Amazon, pink river dolphins are “boto,” shape-shifters that, in the guise of human desire, can claim your soul and take you to the Encante, an enchanted, underwater world. As tributaries braid into a single river, Journey of the Pink Dolphins weaves ancient myth and modern science into one woman’s search for this elusive creature. With their melon-like foreheads and tubular snouts, pink dolphins look eerily familiar, like a person in a watery beginning. No one knows for certain what gives the dolphins their distinctive coloring: They may glow pink with exertion, or with age, or their color might change with the temperature of the water. With their flexible bodies—stretching to 8 feet long and weighing up to 400 pounds—and finely-tuned echolocation abilities, the pink dolphins perform their water ballet on hand-like, five fingered flippers, in a habitat no other dolphin could colonize. Since these mysterious creatures appear mainly at dusk and dawn, and their migration patterns are unknown, Sy Montgomery’s Amazon quest encompasses four separate journeys. 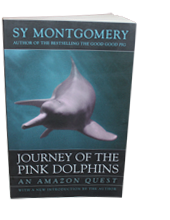 In the Tamshiyacu-Tahuayo region, she follows the pink dolphins to the spirit realm, where shamans commune with the powers of the plants and visit the Encante; with paleontologist Gary Galbreath, she follows them back in time, tracing the history of the species. At Mamiraua, the pink dolphins illuminate the Amazon’s present-day conservation dilemma. And in a final, glorious burst, Montgomery follows them back, down, deep to the watery womb of the world, to touch the very soul of the Amazon. “There are so many stories of boto, you will die writing,” says one river guide. Ancient legends tell us that dolphins have guided humans for millennia, and in Journey of the Pink Dolphins Montgomery answers their call, taking us to that perfect place where the Amazon melts into the forest, dolphins swim among treetops, and the twenty-first century dissolves into the beginning of time. —The New York Times Book Review, Summer Reading Issue.